Non-Diet Tips: Should You Mind Your Lemon Wedges When Eating Out? Should You Mind Your Lemon Wedges When Eating Out? I love eating out, and have gathered up a decent list of restaurant favorites. Last week I had barbecue ribs at one of those restaurants. I also had an appetizer and a tall glass of a fruity alcoholic mix of peache juice,citrus, and some brand of rum. It was great, and I would have had seconds if I hadn’t gotten a bit tipsy by the time the appetizer was done. I’m not a big drinker at all, but for some reason I scoff down fruity cocktails like they were lemonade. I guess the fruit part of it makes you forget that you are actually drinking alcohol. This ‘peachy’ concoction came with a wedge for garnish, not lemon, but orange. It looked like it had seen better days, kind of ragged looking. That beaten-up orange wedge made me almost want to send the drink back because it honestly looked like it had been stored somewhere for days, or was handled by a few too many hands. But I’m not in the habit of sending things back in restaurants, so I simply removed the orange wedge from the glass and put it aside on a plate. Fast forwarding to a few days later. I was watching a very interesting food experiment on Food Network’s Food Detectives this week which immediately reminded me of that beaten up orange wedge. Only this time they were talking about lemon wedges. The food science crew was testing the bacteria in ten samples of lemon wedges from 10 different restaurants. As you know, lemon wedges are commonly served as an accompaniment to a glass of water, or soda or a fruity alcoholic concoction or alongside some sort of sea food. Well, after the petri dishes of lemon samples were all incubated, the results were in, and they weren’t good. Most of the lemon wedges were in a word contaminated, although I have to say none looked as manhandled as my little orange friend at the restaurant. But the results were quite interesting. I’ve had countless lemon wedge pieces at restaurants, and not once, until the peachy drink incident, did I think twice about it. The host of the show tried to offer some reasons as to why, based on their findings, that contaminated lemon wedges seemed so widespread. 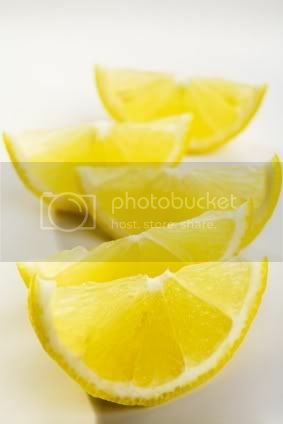 His main conclusion was that because lemon wedges are mostly seen as a garnish, as much care in preparation and storage does not go into them. For example they may not be washed thoroughly or at all and gloves may not always be used while cutting them. That was his take on it. Also, people may figure that the acidity of the lemons would deter bacteria. But some bacteria do thrive in acidic conditions. Bacteria grow everywhere. So next time you’re having that lemon wedge on the side it wouldn’t hurt to wash it thoroughly first in the glass of water you’re usually provided with at the restaurant table. At least that would remove some of the bacteria. If you don’t mind possibly ending up on the kitchen staff’s ‘most wanted list” for messing with their lemon inventory, just ask for the whole lemon. Then you can cut it your own self. Maybe one or two people in the kitchen might want to throw the lemon at you, but at least you know exactly what’s going on with your lemon wedges! :) In fact, why not get out some lemons now and have fun creating something new. In the end, I don’t think that you’re likely to get food poisoning or any serious ailment from a lemon wedge. Unless you’re immune deficient on some great scale, your white blood cells should sufficiently take care of the big bad bacteria. But it is always good to be aware, and educated. Plus I totally dig the whole food science geek thing, so it’s nice to share interesting findings.